On a dolphin watching trip with Encounter Kaikoura, Dusky Dolphins swim around the bow so that passengers can get a close look at these cute animals. Whether the Dusky Dolphins off Kaikoura on the South Island of New Zealand like the display of dolphins on the side of the dolphin watching boat or whether they just like to hang around the bow and enjoy some human interaction is a guessing game. Dusky Dolphins, like most species of dolphins, love to ride in the wake of boats and when Encounter Kaikoura is out with passengers, the dolphins usually show up to play. The waters off of Kaikoura, New Zealand are lucky enough to have these marine mammals hang around the area all year with a small change to their habits in summer and winter. Sperm Whales are another type of marine mammal that can be seen on a regular basis off the Kaikoura coast. Encounter Kaikoura takes passengers out daily on dolphin watching tours if the demand is high enough. To see these lively mammals leap, jump and perform back flips around the New Zealand waters is spectacular especially when you know that they are in their natural environment not in an enclosed pool. 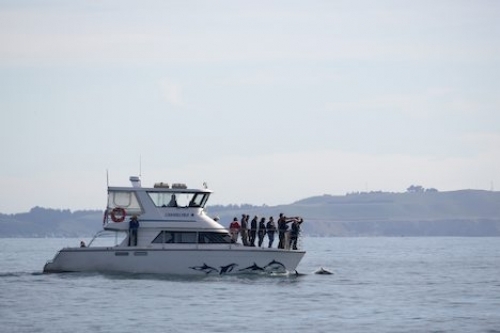 Photo of a boat with Encounter Kaikoura on a dolphin watching excursion off the South Island of New Zealand. Passengers aboard Encounter Kaikoura are not limited to watching the Dusky Dolphins as swimming with these cute sea creatures is also allowed. If swimming with a dolphin is a dream you want to follow through on, then book in advance as you are not the only one that has this dream. The busiest months are between November and April and summer months bring many tourists to Kaikoura, NZ. Safety factors are taken into consideration if passengers want to swim with the dolphins such as the conditions while out on the water around Kaikoura, NZ. Large swells and wind can cause havoc for people in the open waters off NZ and all safety concerns must be met first before jumping in with the Dusky Dolphins. Whether you decide to watch or swim with the dolphins on Encounter Kaikoura, the incredible feeling that one gets from seeing these dolphins is exceptional in itself. People that take a dolphin watching tour while in NZ come to realize that the oceans are spectacular places where a whole new universe exists.